The company's blockchain subsidiary secured a big investment in its security tokens. Shares of Overstock.com (NASDAQ:OSTK) surged on Friday after the e-commerce retailer's tZERO subsidiary announced that a private equity firm would participate in its security token offering. The stock was up about 12.9% at 12:15 p.m. EDT. tZERO has signed a letter of intent with GSR Capital to participate in the company's security token offering. Under the agreement, GSR will purchase $160 million worth of tZERO Security Tokens, with each token priced at $10. tZERO's security token offering has been extended to Aug. 6 to accommodate GSR's investment. About 1,000 people have participated in tZERO's token sale so far, with $168 million pledged as of June 28. The company plans to continue accepting investments until the new expiration date. "This investment from GSR further validates tZERO's strategy to introduce blockchain to capital markets, and this partnership will accelerate our global expansion efforts," said tZERO CEO Saum Noursalehi in the press release announcing the news. "Years ago we saw the world-shaking potential of blockchain, and since then we have been methodical in building tZERO into a company that will bring great efficiency and transparency to capital markets domestically and abroad," said Overstock.com CEO Patrick Byrne. "I truly believe what we are doing is historic and, while there is still much to be done, our success in this STO has given us the resources we need to see it through." Shares of Overstock.com have plummeted this year, down about 61% since peaking in early January. This plunge comes after a cryptocurrency-driven rally that drove massive gains in late 2017. 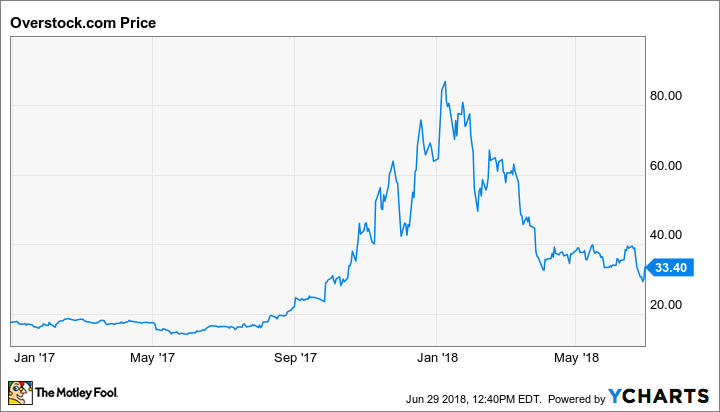 With tZERO securing a large commitment for its security token offering, the stock is regaining some lost ground. But Overstock remains an unprofitable bit player in the e-commerce market, and the ongoing crash in cryptocurrency prices could end up being a death knell for the company's cryptocurrency efforts.